Have you heard about Hank? If not, where have you been? Hank has become a household name when discussing the Milwaukee Brewers in any aspect. 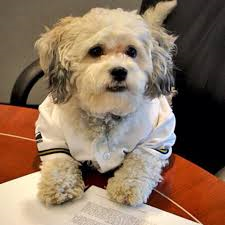 For those of you who aren’t familiar with Hank, here is a short backstory: Hank, believed to be a Bichon-Frise mixed breed, wandered onto the Brewers spring training facility in Arizona during spring training. He has since become the new “unofficial mascot”. – Even made an appearance running in the famous Racing Sausage event during a game. What’s next for Hank? Will we see him in print ads and TV? Will we hear his bark on the radio? Like all good marketers, the Brewers recognized the power of Hank’s story to connect with existing fans, attract new fans, and highlight the charitable nature of the Brewers organization. Are there stories to tell in your company or organization that have the power to motivate and engage your audiences and customers? If so, make sure you are sharing them, not only through word of mouth, but through your other marketing tactics as well. The power of Hank is a good example to follow.